Interfacing microbial, enzymatic, and electrochemical transformations has led to the new field of electrobiotechnology. Among the plethora of applications (including electric energy generation via pollutant removal), the synthesis of chemicals and energy carriers (e.g. H2) has sparked great interest. The linked transformation of chemical and electric energy may allow the joint utilization of renewable feedstock and sustainable electricity to gain commodities and fuels. The overall field is now referred to as bioelectrosynthesis and is a focus of this book. Starting with the rationale for using bioelectrosynthesis in a bioeconomy, this chapter provides a brief introduction to the field of electrobiotechnology. 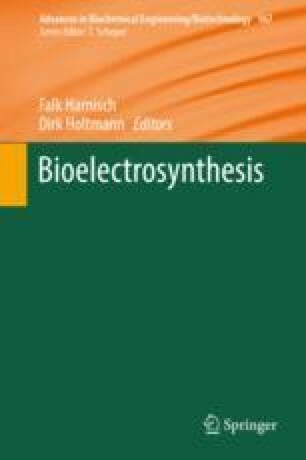 Subsequently, the chapter discusses the framework for bioelectrosynthesis, which is based on enzymes as well as microorganisms, and provides a definition of bioelectrosynthesis. The chapter concludes with a short overview on the history of the field. We are obliged to all authors and referees that contributed to this book, especially the members of our working groups who shouldered the load.